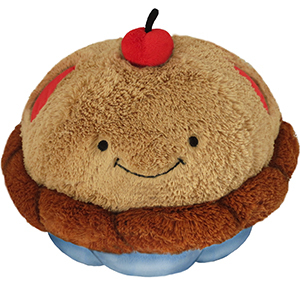 Squishable Cherry Pie: An Adorable Fuzzy Plush to Snurfle and Squeeze! This item is now retired. What was I talking about again? Right, Cherry Pie! You see, Cherry Pie is technically America's fifth most popular pie! Can you believe it? In the pie world, this delectable combination of ripe fruit and flaky pastry is the longshot with big dreams. Right now, the road to #1 is full of obstacles, but with the right combination of training montages, warm hugs from you, and some sweet slow-motion shots in the third act, we can get Cherry Pie to the top of the pie heap! And then we'll put a scoop of ice cream on top of that heap! And eat it! This cherry pie reminds me of a t shirt i had as a kid that had a cartoon pie on it, its face is a classic smiley face that i love so much! Its retired but I found a seller who gave it to me for a good price, i love him so much! He is so cute I got him for Christmas (as well as 2 other sqishables) and now he sleeps on the right side of my bed. After hearing the Cherry Pie was retiring I had to get him ASAP! And I'm so glad I was able to add this adorable Cherry Pie to my collection! Super soft and fluffy and very big! The size was bigger than I thought it'd be. Love the quality of this little guy! Great delivery as always and super fast as well! :) Very Pleased!